Please allow us to introduce the latest pension of Sárospatak. 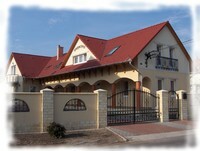 The pension is built in the room of the old farmhouse with all conveniences, homelike apartments and suite. The familiar pension - what is built with love and attention by our 12-year-old building engineering company - can be reached a few minutes walking and it lies in a spa. Please take a look to the offers of our website of the pension and our town too. You can get more informations from our staff. Thank you for visiting our site, and hope to welcome you as a guest!